mmsonline.com December 2016 MMS 75 FEATURE citing cycle times measured in hours for certain drilling and boring operations. In a way, this is a luxur y, because it leaves ample time to plan and conduct scans that generally take about 20 minutes apiece. This isn't to suggest that Tube Hollows doesn't prioritize machining efficiency, Mr. March says. On the contrary, this is always a goal (recently, the company invested in a machine that combines turning and milling functionality). Rather, it reflects the nature of the work. 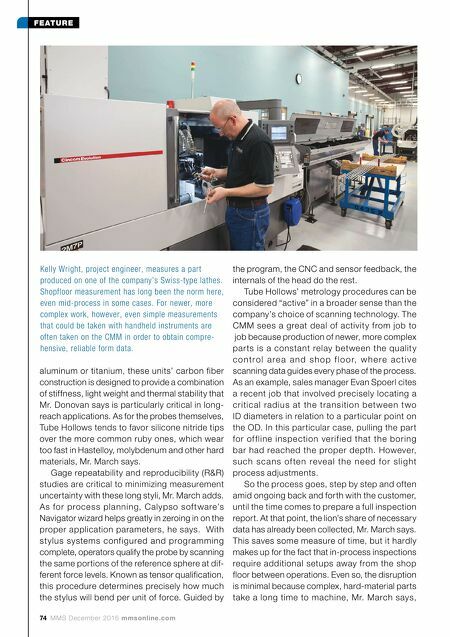 It also reflects the fact that in-process CMM scanning has become a necessity, both for manufacturing par ts in the first place and for providing the comprehensive form data that facilitates critical engineering discussions with customers (hence the willing- ness to perform even simpler measurements on the CM M). In s hor t, custom e r s tur n to Tub e Hollows not for quick-turnaround work, but to solve challenging design problems and to ensure high precision on mission-critical components that can often put lives at stake when they fail. 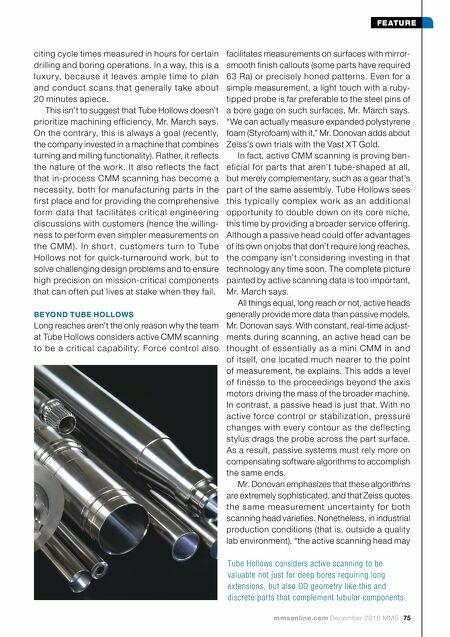 BEYOND TUBE HOLLOWS Long reaches aren't the only reason why the team at Tube Hollows considers active CMM scanning to be a critical capabilit y. Force control also facilitates measurements on surfaces with mirror- smooth finish callouts (some parts have required 63 Ra) or precisely honed patterns. Even for a simple measurement, a light touch with a ruby- tipped probe is far preferable to the steel pins of a bore gage on such surfaces, Mr. March says. "We can actually measure expanded polystyrene foam (Styrofoam) with it," Mr. Donovan adds about Zeiss's own trials with the Vast XT Gold. In fact, active CMM scanning is proving ben- eficial for par ts that aren't tube-shaped at all, but merely complementary, such as a gear that's part of the same assembly. Tube Hollows sees this t ypically complex work as an additional opportunity to double down on its core niche, this time by providing a broader service offering. Although a passive head could offer advantages of its own on jobs that don't require long reaches, the company isn't considering investing in that technology any time soon. The complete picture painted by active scanning data is too important, Mr. March says. All things equal, long reach or not, active heads generally provide more data than passive models, Mr. Donovan says. With constant, real-time adjust- ments during scanning, an active head can be thought of essentially as a mini CMM in and of itself, one located much nearer to the point of measurement, he explains. This adds a level of finesse to the proceedings beyond the axis motors driving the mass of the broader machine. In contrast, a passive head is just that. With no active force control or stabilization, pressure changes with ever y contour as the deflecting stylus drags the probe across the part surface. As a result, passive systems must rely more on compensating software algorithms to accomplish the same ends. Mr. Donovan emphasizes that these algorithms are extremely sophisticated, and that Zeiss quotes the same measurement uncer taint y for both scanning head varieties. Nonetheless, in industrial production conditions (that is, outside a quality lab environment), "the active scanning head may Tube Hollows considers active scanning to be valuable not just for deep bores requiring long extensions, but also OD geometry like this and discrete parts that complement tubular components.